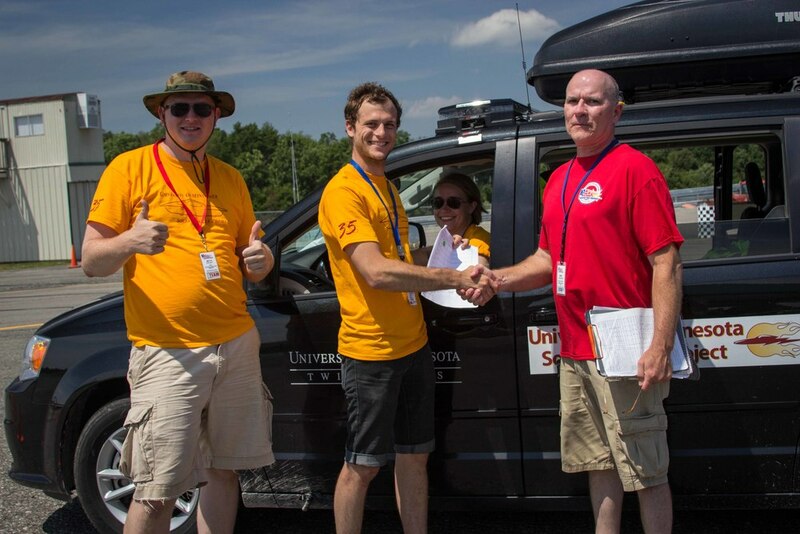 After a day's delay, the University of Minnesota Solar Vehicle Project finally got the opportunity to lead the Formula Sun Grand Prix participants in a stretch and safety circle. We started strong, with roof raisers, keeping our arms limber, and ensured that all of the teams were aware that Gangrene could be a real concern after yesterday's storms. 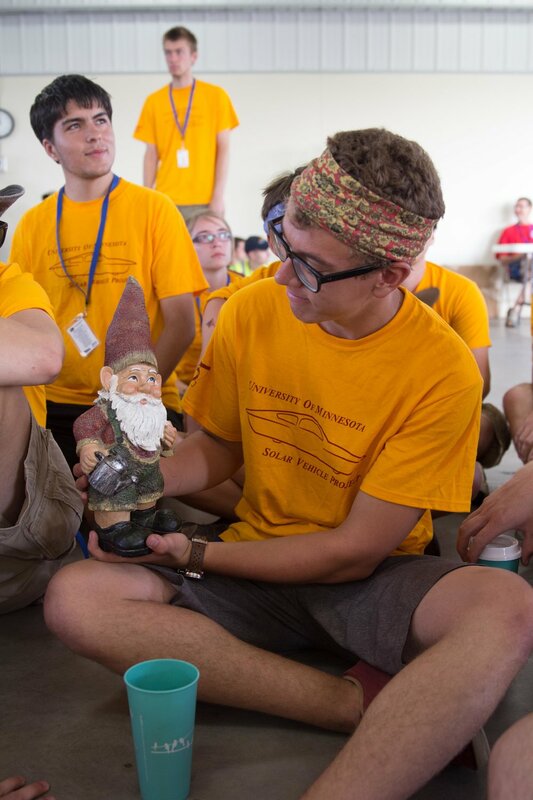 The rest of FSGP kept the momentum, with stretches ranging from lunges to toe touches and safety concerns like lightening and licking batteries. Because we had finished our scrutineering, we were able to move our camp to the top of a nearby hill. Instead of collapsing our tents like nature intended, we decided it would be much quicker and more practical to empty them, send their contents in cars, and carry the tents. This worked very well when four people were able to control the tent poles, but the strategy had a major flaw when two people were trying to control the poles against the wind and gravity. After we remade camp atop our hill, we went back to work on our car, strategizing for the three day track race ahead of us. Our final adventure of the day was to build our radio mast. 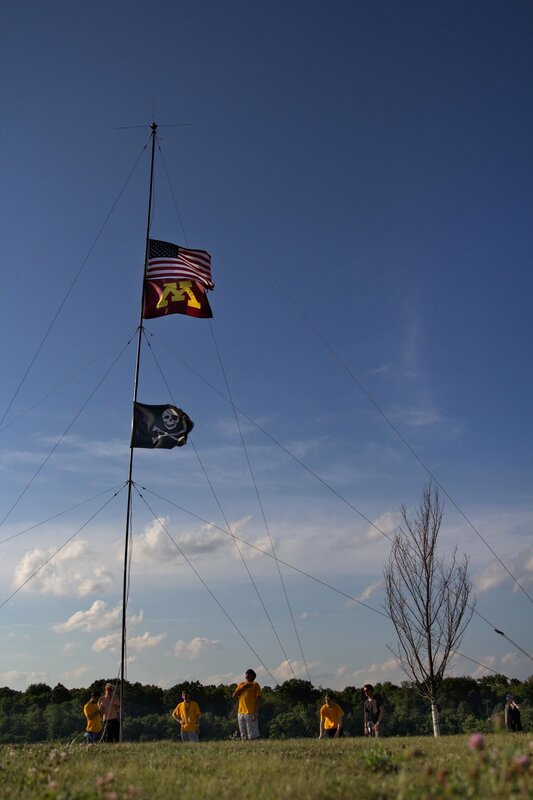 The radio mast is a long pole that lets us simultaneously raise the American flag, University of Minnesota flag, and a Pirate flag as well as our radio antenna, which all work together to improve our radio range. This was erected atop our hill and is a beautiful site from most of the Pittsburgh International Race Complex. As of 5:00 PM today, six teams had passed enough scrutineering to begin racing at 10:00 am tomorrow morning. Scrutineering is still open so we are hoping we will see more cars at the starting line. It will also be open tomorrow, so we are optimistic that more teams will join us as the race unfolds. On Sunday, Eos got into an accident while exiting the dynamic slalom test. No persons were hurt and the car experienced only superficial damage. Our driver took a turn too quickly, causing the car to roll onto its side. Eos then rotated 90 degrees on its side before coming to rest back on its wheels. 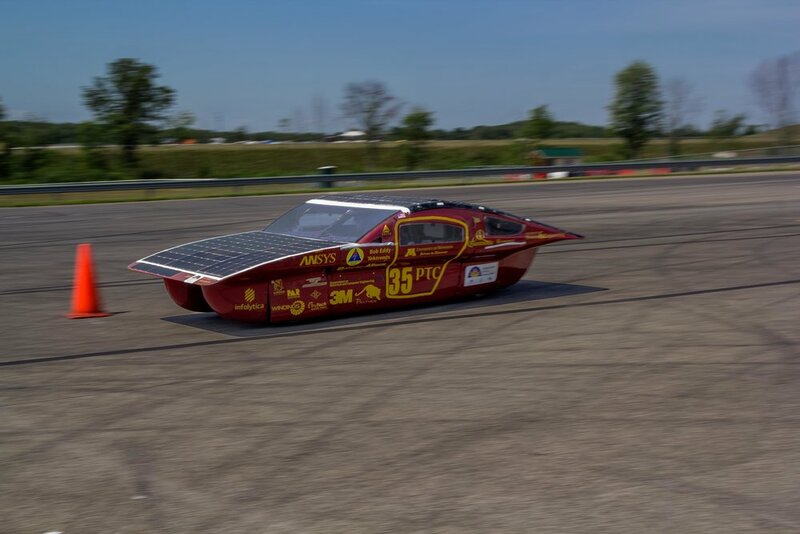 Though this was an unfortunate event, it is important to note this is a type of accident that we have always understood to be a possibility when racing a solar car, and the occurrence has taught us two things. First, our safety requirements are well prescribed. Eos is made to work in the real world where accidents happen no matter how many safety factors we can control. Our car's shell, frame, roll cage, and harness are designed to protect the passengers in the event of the car rolling. Eos is also designed to allow quick exit if needed. To highlight, the car was settled and the driver was out, shaken but unharmed, before anyone had even reached the car. These safety requirements also helped protect the car. With only damage to the car's surface, Eos completed scrutineering by the end of the day. The second lesson lay in driver preparation. 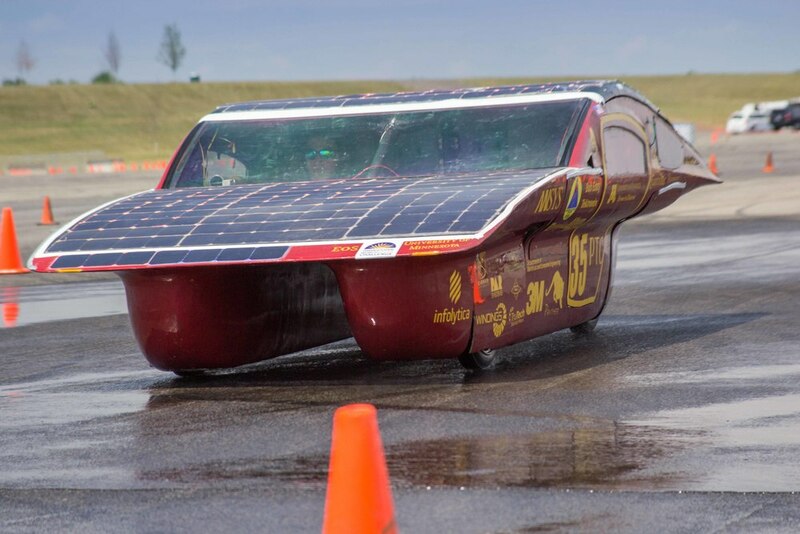 All of our drivers are required to have a state drivers license, but that is not always enough for an experimental solar car. While every competition requires some proof of the driver's ability to control the car, it is difficult to check every scenario in the short time we have for scrutineering. This is why we also implement a driver training program. This incident, however, showed us that we need to reevaluate that program. We spend many thousands of hours building our car; it is only appropriate that we train our drivers to operate our machine carefully and efficiently. Going forward, we are continuing to review the events leading up to the incident, our vehicle designs, and processes to find ways to prevent a similar incident from occurring. To start the day, we registered our driver that arrived last night. Jiadong then immediately got into the car for egress testing. He bolted out of the secondary egress in 8 seconds, clearing in just over half the allowed time. After Jiadong was cleared, we were ready to perform our Dynamic Scrutineering. We were the first team to begin Dynamic Scrutineering, which started with the U-turn test, requiring our car to line up against a brick and complete a full U-turn, ending on the inside of another brick. This was an easy test for Eos, and she had several feet to spare. Following the U-turn test came the figure 8. For this test, one driver was required to run a figure 8 course in a certain time. After several loops, our driver completed the course in the allowed time and we cleared the second stage of Dynamic Scrutineering. For our slalom, cones were placed 18 meters apart and each driver had to slalom through several, maintaining control, in under 11.5 seconds. 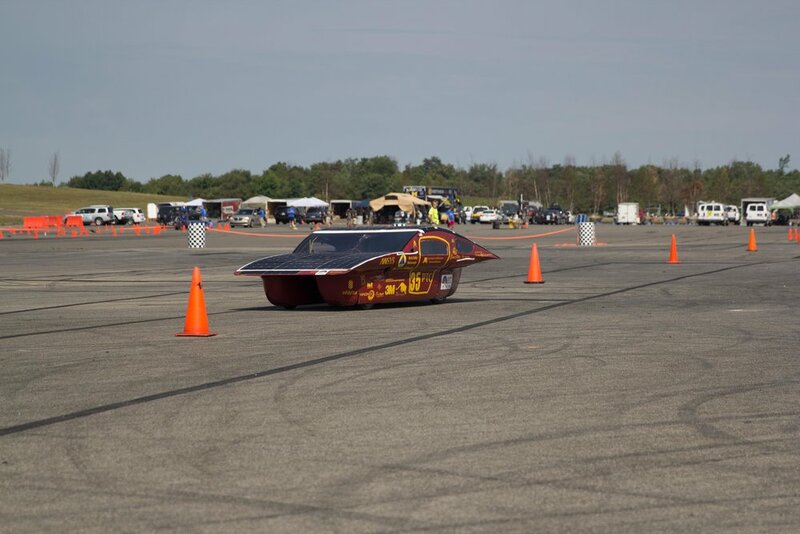 Eos’s first run took over 16 seconds, but after several tries she was fast enough for our first driver to pass. Principia had joined us in dynamic testing at this point. Eos then suffered a minor injury, for which we pulled her out of testing to repair. When we returned, and Michigan had also reached the slalom tests. Our remaining three drivers passed and we moved on to the brake test with Michigan. For the brake test, we had to brake quickly on wet pavement. We ran three drivers through this, and after each driver got a feel for braking quickly in Eos, they were able to complete the test and we passed Dynamic Scrutineering. After Dynamic Scrutineering, we only had a few modifications to make to our car before Eos could officially be ready to race. We hurried back to our camp to increase the strength of our parking break and adjust the taping for visibility, after which we showed our car to the appropriate officials and got cleared to race. We had known that a storm was coming, and as the race officials were examining our car, the rain started. By the time they were finished, the rain was absolutely pouring. We then quickly loaded our car into our trailer for protection and lowered our canopies to prevent them from blowing away. After this, several of us headed into the elements to keep our tents secured, battling the storm for the rest of an hour against stinging rain. Fortunately, our tents survived the storm and our equipment stayed dry. Tonight, we will be working on perfecting Eos for the race and tomorrow we hope to help any other teams with their cars. This morning, ASC invited us to expand our Stretch and Safety Circle to include all of the ASC participants at the Team Meeting. We are looking forward to starting this tomorrow morning and believe that the stretching and daily safety tips could loosen and enlighten all of the North American Solar community to our modern safety concerns. Our scrutineering today began with our lights and vision testing, where we learned that our horn was not loud enough for the American Solar Challenge standards. Our horn was 4 decibels quieter than was required, so we built an additional horn system that was able to break the 75 decibel threshold. After our work, we finally got a green sticker for our lights and vision. After lights and vision, we tested our body and sizing. We had no problems in this area, and received a green sticker. For our Battery Protection System, we passed all of the tests without any problems. The stone faced scrutineer let slip a slight smirk as the battery fans spun up as intended during over temperature testing. We received a green sticker for this station. On our Electrical system, we had to make a slight modification to our motor controller as its casing was shorting our ground potential to the chassis. This was an easy fix and we plan to get it checked off first thing tomorrow. Our Mechanical scrutineering went well, but the scrutineers were concerned with the vertical support in a steering component, in response to which, we are building a pillow block for support. This needs to be glued into our car, so it will be installed after our dynamic testing and before we race. We also broke a bracket in our parking brake, so it is being rewired for safety. After our parking break has been repaired, we will be able to pass this station. Finally, three of our four drivers ran through their qualifications. Drivers were required to exit the vehicle's primary egress in under ten seconds and the secondary egress in under 15 seconds. Chris Yamaguchi set a new record in this test for our team with a primary egress of 4.99 seconds on his second try; Evan and Kory both passed on their first tries. Jiadong joined our team after scrutineering had ended today and will be qualifying tomorrow. Today began with instant Quaker Oats, to the nostalgia of many of our members. Following our hearty breakfast, we went to the Team Kickoff Meeting, where all of the teams were gathered and the officials went over the race and expectations. It was here that we learned that we need at least a yellow on each of our static scrutineering areas to begin dynamic scrutineering. In the break between the Team Meeting and Safety Meeting, we performed our daily "stretch and safety concern" circle, wherein each member of the team announces a stretch for everyone to do to stay limber and then a safety concern, for team members to think about as the day went on and work to avoid any dangerous situations from the heat and sun. Today was the first day that members from another team joined us, as three members of the University of Toronto solar car team hopped in. They thought we were just stretching, but learned the truth when we immediately asked them to lead us in a stretch and share their daily safety concern. In the safety meeting, we covered the importance of properly caring for our batteries to avoid fires as well as the important general safety protocols. Following the safety meeting, we prepared our car for scrutineering and brought it to the paddock. Today, we had Array and Support Crew scrutineering, for both of which we passed with a green.